Dr. Daly is board certified in obstetrics and gynecology. She is a Diplomat, American Board of Obstetrics and Gynecology and a Fellow, American College of Obstetrics and Gynecology. After completing her undergraduate studies at Goddard College, she did her pre-medical training at Columbia University and went on to receive her medical degree from George Washington University. 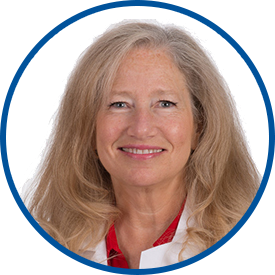 She completed her post-graduate training at Sinai Hospital in Baltimore and George Washington University Hospital in Washington, D.C.
Dr. Daly was with Kaiser Permanente from 1993 to 1999 after which she joined Westmed Medical Group. She is affiliated with White Plains Hospital. *Dr. Daly have being my Gyn for over 15 years. I trust her with my health care. I feel like I'm in very good hands in Dr. Dalys care and trust her expertise completely. She is an exceptionally caring doctor. I would have no hesitation in recommending Dr. Daly to others. great professional experience- already recommended to my best friends! Dr. Daly was truly amazing! She was so friendly and very detailed in her answers to any questions I had. I felt so comfortable with her considering it was my first visit and I was nervous. I would recommend her to a friend or a stranger! Dr Daly is friendly, and goes the extra mile with your care. I was impressed with how fast she responds through the portal. I have confidence in her abilty to assist me with my mefical care. I am VERY pleased with my visit to DR Virginia Daly. It's been 10 yrs and she talked me through everything making me feel so at ease.